The first 2016 Round Britain Coastal Drive, took place in September 2016, with over 200 Jaguar E-types taking part to raise money for Prostate Cancer UK. 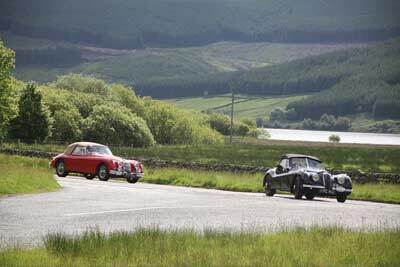 The 2017 Round Britain Coastal Drive event will run between June 12th and 29th, this time for classic Jaguar XK‘s. The 18 day event follows the coastline of the UK, taking in some of the finest roads in England, Scotland and Wales. The event was the brainchild of author Philip Porter, who founded the International Jaguar XK Club 19 years ago. Porter drove the entire route in his E-type which featured in the film The Italian Job, a few months after recovering from prostate cancer himself. ‘The drive was absolutely superb,’ says Porter, ‘and all the publicity did a great job raising awareness of prostate cancer which kills a man every hour in the UK’. The Jaguar XK120 was the car that put Jaguar back on the worldwide map after WW2. Leading Britain’s ‘Export or Die’ campaign to earn vital dollars after WW2. 70 years later, Jaguar XK’s are leading the battle against Prostate cancer, which affects one in eight men in the UK. The 2016 RBCD event raised over £60,000 in aid of Prostate Cancer UK beating their £50,000 target. This year the aim is to do even better.